Date nights are a great way to reconnect with your partner and spend quality time together without the distractions of children, work, or other obligations. However, it is not always easy to carve time out of busy schedules to hang out as a couple, and by the time the weekend rolls around, you may be too exhausted to even consider getting dressed up and going out on the town. If the club scene just isn’t your thing anymore or the idea of dressing up and dealing with finding parking and making reservations to dine amongst other people just isn’t that appealing, at-home date nights might be more your style. After all, they are much easier to plan, can happen whenever you find some free time, and do not require getting out of your pajamas. You can also save money on babysitters by having at-home date nights after the kids have gone to bed. Now that you have decided that date nights at home are a good solution for spending time together without worrying about hiring a sitter or figuring out which new restaurant to try, you need to find a way to make your date night special. After all, if it just feels like every other night of making dinner and catching up on recorded shows, then it will not feel much like an actual date night. First, let’s look at a few general tips for successful date nights at home in your own backyard. Make sure the kids are settled in for the night, leave your phones inside, and make sure you put away any yard maintenance tools or other items that will remind you of your to-do list. Date nights usually do not just happen. 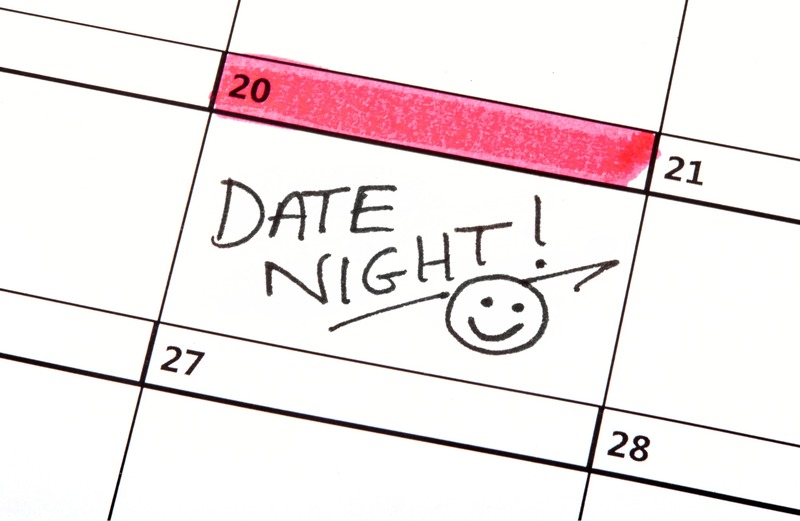 If you have jobs and kids and other responsibilities, you are going to have to plan your date nights to make sure you find time in your schedule to connect as a couple. Planning backyard date nights should not fall on the shoulders of just one partner. Take turns planning your dates and use this as an opportunity to surprise your partner or show them how special they are to you. Make a list of potential date night ideas to make it easier for both of you to plan a special night when it is your turn. This also allows you to more easily plan your dates without having to come up with ideas at the last minute. Even the best-laid plans can be interrupted by a child with a stomach ache, one partner having to unexpectedly work late, or inclement weather. So, have a backup plan and be flexible – the important thing is making time for each other when you can. If you do not have a backyard, most backyard date night ideas will work just as well on a balcony, porch or rooftop deck. If you are simply too exhausted at the end of the day to have a date night, try making your dates in the morning. Set your alarm early so that the two of you can enjoy coffee and breakfast together on your patio as you watch the sunrise before the kids get up. Date nights are all about connecting as a couple, which can be even more fun if you are also trying a new food or learning something new together. You do not have to plan an evening of wine, cheese, and a romantic movie just because that is a pretty typical at-home date night. If that is not your thing, then tailor your dates to suit your personalities. Beer and board games, energy drinks and video games, or sodas and sports all work just as well. Your backyard date night does not have to be a big production. The important thing is that you are spending time together, so it can be as simple as throwing a blanket on the grass and watching a movie on your laptop. If you have nearby neighbors, part of creating a romantic setting might involve sound or sight barriers, such as a water fountain or music, and privacy landscaping or a privacy screen. 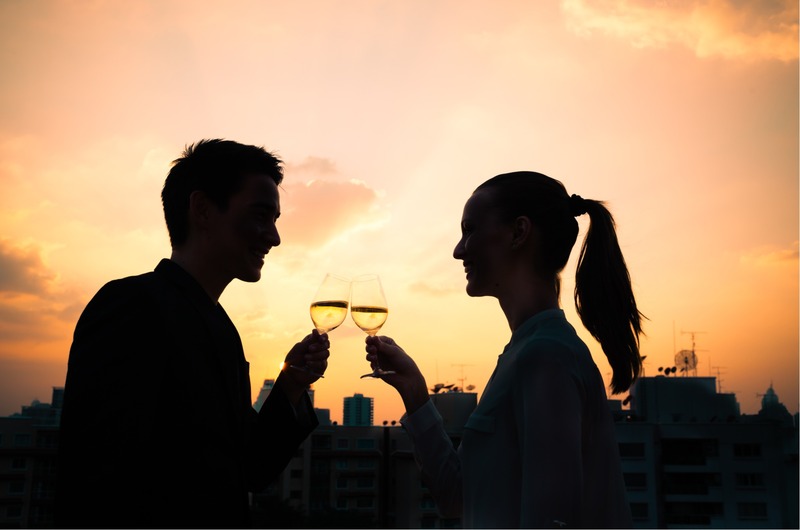 Your date nights should reflect your personality, be enjoyable for both of you, and allow you to connect as a couple. To help you create memorable nights without leaving home, here are 21 backyard date night ideas to inspire you. 1. Read poetry to each other. This is a simple, low-cost date night idea that can be as short or as long as you like. It might involve wine or sitting by your patio fireplace, but even the smallest balcony will work for an outdoor poetry reading. Making homemade ice cream is a fun activity to do as a couple and provides you with a tasty dessert to enjoy when you finish. But, you cannot cheat and use an ice cream machine or the plastic bag method; you have to make the kind of homemade ice cream that you mix in a coffee can and roll back and forth to each other across the patio until it is finished. This one takes a little bit of planning, mostly because you probably do not have rock salt in your pantry, which you will need to make this frozen treat. If you did not grow up making ice cream like this, check out this tutorial. 3. Have an outdoor game night. Whether you prefer board games or card games, having an outdoor game night will make it more romantic and more fun. You might add your favorite adult beverages to spice things up, or you could make the above-mentioned ice cream first and have dessert while you play. Chech out a few of our favorite outdoor games. 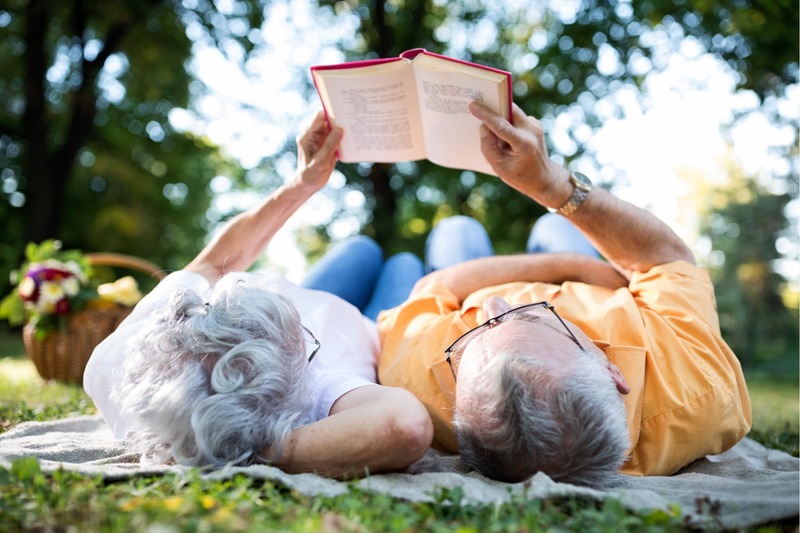 Create a fun, relaxing date night by choosing an audiobook, and then setting up your outdoor living area and planning your menu around the theme of the book. If Edgar Allan Poe is your pick for the night, you might serve absinthe and decorate your patio with skulls, candles and ravens. If you are more in the mood for The Great Gatsby, decorate your outdoor living space as a speakeasy and don’t be shy with the champagne. 5. Schedule a ballroom dance class. Hire a ballroom dance instructor for a private lesson for you and your partner in your backyard. Depending on how much planning you want to put into it, you can rent a dance floor or simply use your deck or artificial grass lawn as your dance space. After the instructor leaves, use a pre-planned playlist to practice your new moves under the stars. If you happen to have an amazing sunset view from your backyard or balcony, watching the sunset over the ocean or mountains is a no-cost, romantic date that requires no planning (other than knowing what time the sun will be setting that day). If you have not had a date night in a very long time, this is the perfect chance to bring back old memories by going through photo albums from when you were first dating, watching your wedding video, or reminiscing with funny stories from your years together. 8. Go back to the good old days. Before you had kids and careers and got busy being responsible adults, was there something the two of you used to love doing? Maybe you used to stay up all night watching low-budget horror films or thumbing through your vinyl record collection. Now is your chance to make time to do those things you used to love to do together – only, this time, you get to enjoy it in your outdoor living area. 9. Have a puzzle night. Put together the perfect playlist, get the patio fireplace going, pour some wine, and spend the evening accomplishing this time-honored, team-building task. 10. Plan an outdoor craft night. Backyard date night ideas do not have to be serious, but they do have to be enjoyable. So, if you are both the crafty sort, plan an outdoor craft night where you can listen to great music, sip your favorite beverages, and work on a fun craft project. 11. Schedule a couples massage. Hire a team of massage therapists for a little at-home pampering with a couples massage on your patio or deck. Make sure to plan for post-massage drinks and snacks before your massage so that all you have to do afterwards is relax and enjoy each other’s company. If you have an outdoor dining room, you might eat outside all the time, so make this a special occasion by using a picnic basket and a picnic blanket and setting up your feast on the lawn or deck – not at the same table where you regularly host al fresco dinner parties. Stock your patio wine refrigerator, cut up vegetables for kabobs, set out the condiments, and create a fantastic grilled meal for two. 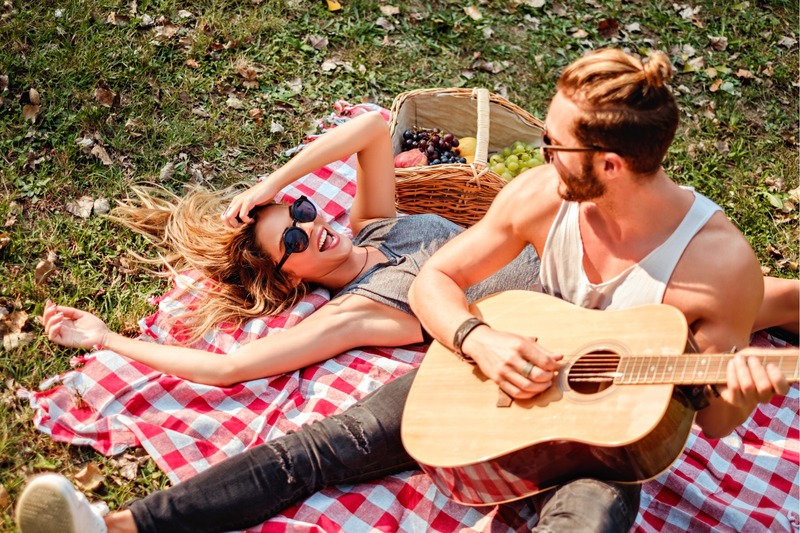 While you are preparing and grilling the food together, you can catch up on how your partner’s week went or start working out the details of your next romantic getaway. 14. Take a cooking class. Hire an instructor or watch an online cooking tutorial and learn to cook something new together in your outdoor kitchen. 15. Take movie night outside. Stock up on candy, make some flavored popcorn, or prepare some simple finger foods, and then settle in on cushions, a hammock, or your patio sofa to watch a movie. If you have an outdoor TV, then this might be something you do all the time, but if you do not, you can take a free-standing television out to your patio or create your own outdoor movie theater with a screen and projector. If you happen to have a full day off together or are up for an all-nighter, you might consider a trilogy for your next backyard date night. 16. Cuddle by the fire. If it has been a long week and you just want some low-key alone time, this is a simple backyard date night idea that requires almost no planning. As long as you have fuel for your fire pit or patio fireplace and your favorite beverages on hand, all you need to do is put on some comfortable clothes and head to the backyard for a relaxing evening. Grab a blanket and a bottle of wine and head into your backyard for an evening of stargazing. 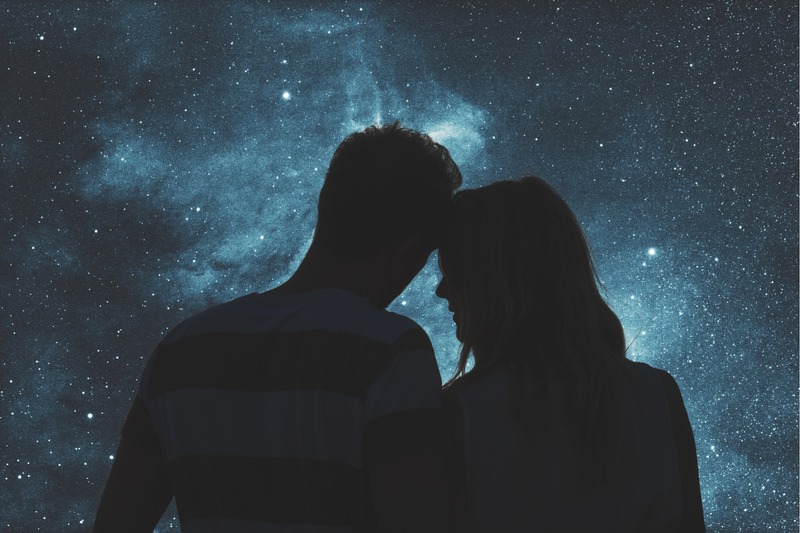 Although you are supposed to leave you phones inside on date night, you might want to bring one with you to use a stargazing app to help you find constellations. 18. Enjoy an impromptu video night. If you happen to find some free time and do not have anything planned, you can enjoy an impromptu date night with your partner, your favorite beverages, and online videos. Whether you like cat videos, bloopers, or music videos, just find a genre you can both agree on and settle in with your laptop or tablet for a relaxing evening. 19. Plan a chef-prepared, candlelit dinner under the stars. Most people cannot afford to have a personal chef make all of their meals, but it is much more affordable to hire one just for special occasions. Hire a private chef to come to your home to grill or cook a meal for you and your partner to enjoy by candlelight under the stars. 20. Go camping in your backyard. If it is difficult to get away to go camping for the weekend, you can set up your own campsite right in your backyard. Pitch a tent, roll out your sleeping bags, and tell ghost stories while you roast hot dogs over the fire pit and, of course, make s’mores. 21. Settle in for a gamer date night. If you are both gamers, then this one is a no-brainer and will only require determining the best way to set up your screen, projector, and gaming console outside. Then you can settle in for an evening of energy drinks, snacks, and playing your favorite game together. Even if you are not avid gamers – or had to give it up when you started working more or had kids – this is a fun backyard date night idea that might take you back to your youth. Buy an old gaming console and a few games, then set up a retro gaming night with games the two of you enjoyed in your younger days. If you plan ahead, you have plenty of time to find Legend of Zelda or Pac Man for older gaming systems.